The Un-carrier is releasing a significantly upgraded and rebranded Layer3 TV in eight markets. 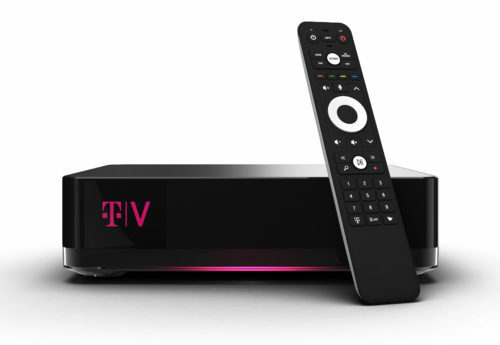 • What’s the news: T-Mobile introduced TVision™ Home, a newly upgraded version of Layer3 TV, in eight markets. • Why it matters: T-Mobile has already been wildly successful disrupting the wireless industry. Today brings the Un-carrier one step closer to taking on Big Cable later this year. • Who it’s for: The 74% of American households currently paying an average of $107.30 per month for cable or satellite home TV service who are tired of the hidden fees, bill creep and lousy customer service. BELLEVUE, Washington — T-Mobile (NASDAQ: TMUS) today introduced TVision™ Home, a rebranded and upgraded version of Layer3 TV. TVision Home is launching in Chicago, Dallas-Fort Worth, Los Angeles, New York City, Philadelphia, San Francisco, and Washington DC metro areas, as well as Longmont CO, with other markets coming later this year. The Un-carrier is also launching Satellite Freedom and will pay off early contract termination fees for Dish and DirecTV customers, up to $500 via prepaid card, when they switch to TVision Home. T-Mobile also announced that Netflix and other streaming apps will be available on TVision Home, and the Un-carrier shared plans for TVision to run on popular third-party TV platforms in the future. Following on its deal with Viacom last week, T-Mobile also announced they will launch nationwide streaming services later in 2019 as the Un-carrier brings its disruptive approach – listening to customers and solving their pain points – to cable & satellite TV (aka the Cableopoly). TVision Home builds off the innovations in Layer3 TV and delivers an upgraded, premium TV experience for the 74% of American households still using traditional cable or satellite TV. TVision Home delivers what customers want most from high-end home TV with more HD premium channels available than anyone else, and the most 4K channels included at no additional cost. That’s 275+ available channels and over 35,000+ On Demand movies, shows and more, plus on-screen social content, a personalized home screen and DVR for each user, smart speaker voice control with Amazon Alexa or Google Assistant, and even access to your security cameras. TV That Learns You: Traditional TV is completely impersonal, but TVision Home changes all that with an AI-driven personalized UI that gets smarter the more you watch. And it remembers more than what you watch…it remembers when you watch it, and where you watch it, serving up your favorite shows based on the hour and location. Personalized Experience for the Whole Family: TVision Home boasts a personalized experience for everyone in the house, with an individual DVR, home screen and profile for every user, so you record only the shows you want – multiple programs at once! You get a massive 1 terabyte of storage – that’s 400+ hours of DVR in HD. Smart Home Connected with On-screen Social Media: TVision Home is connected to your digital life and your devices. View a slideshow of your Facebook videos and picture, check your Twitter profiles, use your voice to control TVision Home with Amazon Alexa and Google Assistant, and monitor your front door with access to your security cameras, all right from your TV. Streaming & Cable Together: TVision Home launches with apps for Pandora, iHeartRadio, XUMO, CuriosityStream, Toon Goggles and HSN. And with an open platform, more apps are coming soon, including Netflix, YouTube, YouTube Kids and more! And, T-Mobile will soon release a companion app for iOS and Android, allowing you to stream all your TV to your smartphone anywhere in the house. Dedicated Customer Care. TVision Home customers get a TVision-dedicated customer care team from the company that ranks #1 in wireless customer service satisfaction year after year. No Hidden Fees. Big Cable loves fees like Broadcast Fees, HD fees, Activation fees and Early Termination Fees. And, all those fees add to as much as 40% of a cable customers’ bills – that’s up to $737 a year in hidden fees(1)! Not with TVision Home. Our straightforward pricing doesn’t have pages of extra fees, so you’ll never experience bill shock again. No Bill Creep or Exploding Pricing. Traditional cable and satellite TV locks consumers into a two-year contract with one rate, and then – surprise! – after the first year, they get “thanked” for their loyalty with a bill that’s up to 144% higher(2). DirecTV Xtra is advertised at $55/month, but in year 2 of the contract, it’ll cost you $124/month – and that doesn’t even include the $8.49/month regional sports fee or all the other fees. With TVision Home, your price stays the same, unless you change it. Period. One consistent price for a full channel lineup. TVision Home launches at $90/month (including a $9.99/month discount for T-Mobile customers … but available to everyone for a limited time) which includes 150+ channels, local broadcast, regional sports and more. Plus $10/month per connected TV, including your whole-home DVR for a limited time. Any premium TV packages – like HBO, Showtime and others – or on-demand rentals and purchases are extra. Compare that to the average cable bill of $107.30/month. Nearly half (48%) of pay TV customers are locked into a contract and face paying hundreds in early termination fees. With Satellite Freedom, T-Mobile is tackling the #1 reason customers stay shackled to TV providers they don’t like: early termination fees. The Un-carrier will pay off those fees, up to $500 via a prepaid card, for any Dish and DirecTV customers who make the switch, freeing millions locked into long-term contracts with steep cancellation fees. Goodbye fees, hello freedom. TVision Home is part of T-Mobile’s 5G strategy and vision to give consumers real options to the cable companies, and that starts with the Sprint merger. Today, almost half of the country’s households (45%), and more than three quarters of rural households (76%) have no high-speed service (100 Mbps average) or only one option for high-speed broadband(3). But if the merger is approved, by bringing together T-Mobile and Sprint, the New T-Mobile will have the scale and capacity to create a supercharged 5G network capable of reaching over half the country’s households with high-speed broadband by 2024. And while TVision Home uses your existing wired broadband today, TVision Home is IPTV designed for a 5G future where wireless broadband can replace your home internet. That means millions can finally free themselves from the Cableopoly once and for all. TVision Home will be available on April 14 in T-Mobile stores and online in Chicago, Dallas-Fort Worth, Los Angeles, New York City, Philadelphia, San Francisco, and Washington DC metro areas, as well as Longmont CO. For more information, visit www.tvision.com and follow @TVision on Twitter. Limited time offers; subject to change. Check to confirm service and channels in your area. Channels & packages can change. Plus taxes; taxes approx. 4-20% of bill. Credit/debit card & connectivity. Select content available in 4K with compatible TV/device. Third-party subscriptions may be required for some content. See Terms and Conditions (including arbitration provision) at TVision.com for additional information. Satellite Freedom: Qualifying credit & 90+ days with eligible Satellite TV provider at same address as new TVision service required. Timely redemption required. Via prepaid MasterCard Card. You must be active and in good standing with T-Mobile when payment is processed; allow 10 weeks. Cards issued by Sunrise Banks N.A., member FDIC. Terms & conditions apply; card expires.